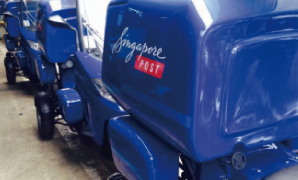 postmen to handle compared to the two-wheelers, and hence improve work safety. storage space than the first generation three-wheelers. years old, saw how the changing times have affected the mail profile. Group CEO (1st from the right) at the launch of the 2nd generation three-wheeler. Minister Yaacob mingling with the postmen and couriers at SingPost’s “Iftar” event. Singapore and the Asia Pacific region, with operations in more than 14 countries. citizens, residents, corporations and businesses in Singapore.